Accounting sustainably involves accounting for and to the natural environment, and accounting for and to society, including groups currently oppressed or disadvantaged by unsustainable processes and practices. 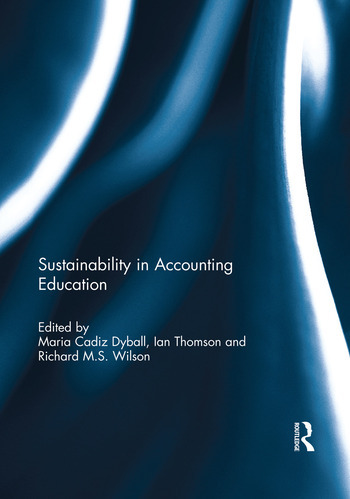 This book creates a compelling case for the inclusion of sustainability at the heart of accounting educational programmes, offering critical lessons and identifying risks to avoid when designing accounting programmes and courses. Accounting sustainability has moved from the side-lines of policy discourses, accounting institutions, professional accounting practices, and research activities into the mainstream. The chapters in this proposed book engage in a critical dialogue to facilitate change in accounting education for sustainability. They dispel the myth that accounting for sustainability is an oxymoron, bad for business, unrelated to practice, or contrary to professional accounting bodies’ accreditation requirements. This book was originally published as a special issue of Accounting Education. Part 3: Rhetoric or Reality? Maria Cadiz Dyball is Associate Professor of Accounting at Macquarie University, Australia. She has diverse research interests that explore differences and shifts in philosophies and traditions and how these are mediated through and reflected in accounting professionalisation projects, practices, and education. Professor Dyball has published widely in top-tier academic and professional journals and her research is supported by external, competitive grants. Ian Thomson is Professor of Accounting at the University of Strathclyde, UK. He has undertaken research into many different aspects of accounting and sustainability. These projects have included interdisciplinary studies on implementation of cleaner technology, establishing industrial ecologies, effective stakeholder engagement, risk governance in water and salmon farming, sustainable development indicators, government policy-making, external accounting and accounting education. In 2012, he was elected convener of the governing council of the Centre for Social and Environmental Accounting Research. Richard M S Wilson is Emeritus Professor of Business Administration and Financial Management at Loughborough University, UK. He has devoted his career to boundary-spanning (e.g.as practitioner and professor, across disciplines, and in different jurisdictions). For 40 years he has been active nationally and internationally in educational policy-making on the interface of accounting education and training; has worked in more than a dozen countries; has published widely; is the founding editor of Accounting Education: an international journal; holds two Lifetime Achievement Awards (one specifically for his work on accounting education); and is an Academician of the Academy of Social Sciences.